Having grown up in and around Boston, the filmmaker left home for an even more (seemingly) desolate place: the Midwest. While studying French and Literature at the University of Wisconsin-Madison, Gordon decided to spend her junior year studying in Paris where she found herself taking a film class that would change her life. Having seen Godard’s Breathless in high school, Gordon had always carried an “unconscious interest” in film and suddenly found herself being taught by somebody from one of the most respected film journals, Cahiers du Cinema. Here, she learned “everything about cinema”. 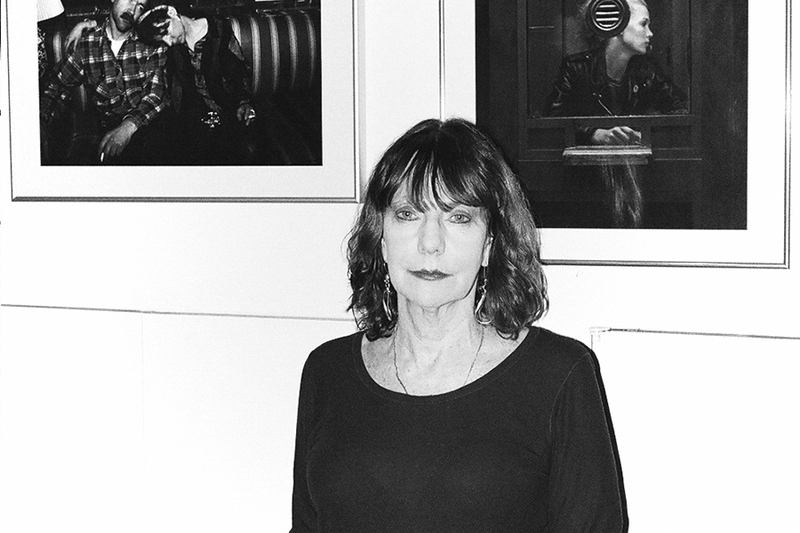 Gordon began shooting experimental films back in the Midwest and eventually made her transition to New York City where she became immersed in the underground arts scene of the 1980s and quickly became identified with the No Wave cinema movement. Her first feature, Variety (1983) featured an impressive group of downtown artists including writer Kathy Acker, composer John Lurie, cinematographer Tom DiCillo, photographer Nan Goldin, actors Spalding Gray and Luis Guzmán. Gordon is currently a professor at Columbia University. She has continued her work as a filmmaker, notably with 2009’s Handsome Harry. Her most recent film, The Drowning, is a psychological thriller that advances Gordon’s penchant for voyeurism and the subversive. Thriller films are largely under-represented by female directors. For the month of September, The Roxy will explore the female-directed thriller in a series Gordon helped to curate called “ThrillHer”. On September 20th at 7pm, Gordon will be in attendance for her film, Variety, followed by a Q&A. Recently, Roxy contributor Hillary Sproul sat down with the director to talk a bit about filmmaking today and the downtown NY arts scene in the 1980s. Bette Gordon: A lot of people when they talk about this stuff have in the back of their minds that they want to be able to do this. It’s not as difficult to make a film anymore in terms of expense—you know, it used to look like, “Oh my god, I need a camera… I’ve got to rent it… Film is expensive… Processing…” That’s no longer true. There used to be festivals when we were in the seventies and eighties. There are more festivals today and you would think that would make it easier but it doesn’t. Because those festivals often just show the same groups of films that circulate. In our day, it might have been a bit easier because there were fewer filmmakers and it was a more specialized thing. It was kind of an odd thing like, “Yeah, I’m a filmmaker”… People would do a double take and now every kid growing up in every high school class chooses media and film because of the advantage of growing up in this very digital world. Maybe, for me, there’s an almost glut of too many things… How do you choose what to watch? People are just overwhelmed. It’s almost so much that it becomes almost homogeneous. It’s just too much of the same thing and I find it very difficult to navigate. People ask me about what it was like in the eighties when I began making features and more narrative films and the main thing is that there was really no huge marketplace. The marketplace was in Hollywood. New York existed always with a small group of people like Cassavetes, Shirley Clarke, Robert Frank… These kind of maverick filmmakers. HS: Which is, of course, the group we all wish we could be part of today…. BG: Well, the beauty (of that time) was that it was not so driven by Sundance. It was not driven by anything other than a desire to make something. The art world was smaller; the world existed in a much smaller block or radius of streets in New York. It was easy to meet people and to go from The Kitchen where there were performances or the Wooster Street or The Performing Garage. I ran—with my friend Renee and a lot of her friends from SUNY Binghamton—a little theatre right down here in Tribeca called the Collective for Living Cinema. It was on White Street and we showed only on the weekends. We mixed up a lot of very eclectic programming—it was brilliant. There were short avant-garde films, there were features that were just beginning to get made, Super 8 films, Hollywood films like Singing in the Rain or horror films like Larry Cohen’s God Told Me To, kind of weird, bizarre films like that… And then we’d have people like Jack Smith come and do performances. I got some money because, working at The Collective, you always were working with grants and grants are what helped filmmakers make films then. Now they’re practically nonexistent and the few that are out there are so small. I wrote a grant about the politics of The Living Cinema and so, we did four or five panels. They were great. There was one on cinema from the third world—and B. Ruby Rich came on board—and there was a panel on women directors… Sally Potter was there and I was there. HS: Were there other theatres like this at the time? BG: The Kitchen was doing these kinds of seminars. There was the Anthology Film Archive that still exists and a place called Millennium that was in the East Village and they even had a little workshop where you could take classes. We even gave classes at The Collective where you could just sign up. I think I taught some of them. It was all hands on like, “Here’s a camera and this is where you load the film.” It was all film. It was very simple but I guess there was this do-it-yourself mentality that exists even today in the DIY mentality of Kickstarter… So, so many good things translated from then to now are very different. HS: I talk about this with people… There’s a lot of, “Oh, it would have been so much better back then” because there wasn’t so much stuff. BG: Well, that is true. There wasn’t; there really, really wasn’t. HS: And the people that were making work really wanted to make it just to make it. Those of us now that want to “make it just to make it” sometimes feel kind of like, “Why are we doing it?” Because everybody is doing it and it’s all about money and it’s all about image. It’s interesting to talk to you because you have a sense of what it was then and you can translate that to today. BG: Yes. And the advertising was the last thing that kind of attracted people. Eventually, a lot of great, more experimental filmmakers did go into advertising because advertising co-opted the very non-sequential, almost-montage visual style of a lot of visual filmmakers. So, you know, that happens anyway. The avant-garde is only the avant-garde for a moment in time before it gets usurped. I mean, look at the music that’s used on commercials today; hearing Bob Dylan’s voice on a commercial was—for me—the end. HS: Music feels very oversaturated to me as well. BG: That’s the problem: oversaturation. BG: Yes. In those days, we got a lot of people for very little money. I remember when I ran into Luis Guzmán… Somebody introduced me in the East Village or the Lower East Side and I said, “Well, I can pay you $25 a day” and he just said, “Fine”. There were no contracts or anything like that. It was just out of this sense of exploration and what it would be like to get people from any different discipline… musicians being actors, actors being musicians, performing artists kind of joining in some more classical music way of thinking… You know, it was a huge collaborative mix of different disciplines all coming together. We were in the time when graffiti was just becoming this thing that was everywhere and it was beginning to be celebrated in some of the smaller galleries. My friend Charlie Ahearn—who I’m still very close with—made “Wild Style” which is one of the first features that really took Fab Five Freddy and a lot of the graffiti artists of the day and put them together in a movie. It’s just such a seminal film and much like “Variety”, it landed in a moment in time that said something about the time in which we were living but continued to be able to speak about that in relationship to today.